This chapter outlines the history of international drug control and the emergence of a war on drugs approach to global drug policy. It documents the failure of this approach and explores the unintended and harmful consequences that have been caused to both consumer and producer countries as a result. The final section highlights attempts to move away from the war on drugs. 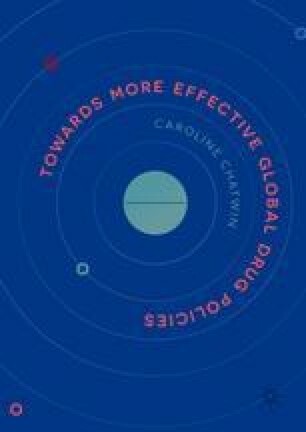 It employs case studies of recent responses to New Psychoactive Substances and UNGASS 2016 to suggest that a war on drugs approach to global drug policy endures. Bewley-Taylor, D. (2012a). The contemporary international drug control system: A history of the UNGASS decade. In J. Collins & N. Kitchen (Eds. ), Governing the global drug wars (LSE Special Report SR014). https://www.eprints.lse.ac.uk. Bewley-Taylor, D., & Jelsma, M. (2011). Fifty years of the 1961 single convention on narcotic drugs: A reinterpretation. Series on legislative reform of drug policies. Transnational Institute: http://www.tni.org. Bewley-Taylor, D., & Jelsma, M. (2012). The UN drug control conventions: Limits of latitude. Transnational Institute: https://www.tni.org. Bewley-Taylor, D., Jelsma, M., & Blickman, T. (2014). The rise and decline of cannabis prohibition. Transnational Institute: http://www.tni.org. Birdwell, J., Chapman, J., & Singleton, N. (2011). Taking drugs seriously: A demos and UK drug policy commission report on legal highs. http://www.ukdpc.org.uk. Felbab-Brown, V. (2008). Counternarcotics policy overview: Global trends & strategies. Brookings: https://www.brookings.edu. Felbab-Brown, V. (2015). No easy exit: Drugs and counternarcotics policies in Afghanistan. https://www.brookings.edu. Felbab-Brown, V., & Trinkunas, H. (2015). UNGASS 2016 in comparative perspective: Improving the prospects for success. https://www.brookings.edu. Fordham, A. (2016, May 3). The drugs consensus is not pretty—It’s been ripped apart at the seams. Huffington Post. http://www.huffingtonpost.co.uk. Galeotti, M. (2015). Narcotics and nationalism: Russian drug policies and futures. Brookings: https://www.brookings.edu. Gberie, L. (2015). Crime, violence and politics: Drug trafficking and counter narcotics policies in Mali and Guinea. https://www.brookings.edu. Global Commission on Drug Policy. (2011). War on drugs: Report of the Global Commission on Drug Policy. http://www.globalcommissionondrugs.org. Global Commission on Drug Policy. (2016, April 21). Public statement by the Global Commission on Drug Policy on UNGASS 2016. New York: Global Commission on Drug Policy. http://www.globalcommissionondrugs.org. Haken, J. (2011). Transnational crime in the developing world. Global Financial Integrity: http://www.gfintegrity.org. Hakim, P. (2011). Rethinking US drug policy. Inter-American Dialogue: https://www.thedialogue.org. Hope, A. (2015). Plus Ca change: Structural continuities in Mexican counternarcotics policy. https://www.brookings.edu. Jelsma, M. (2015). UNGASS 2016: Prospects for treaty reform and UN system-wide coherence on drug policy. Brookings: http://www.brookings.edu. Kilmer, B., Midgette, G., & Saloga, C. (2015). Back in the national spotlight: An assessment of recent changes in drug use and drug policies in the United States. Brookings: https://www.brookings.edu. Ki-moon, B. (2013). Statement: Secretary-general’s remarks at special event on the international day against drug abuse and illicit trafficking. United Nations. http://www.un.org. Klein, A. (2011). ‘Written evidence to the House of Lords’ enquiry into the European drug strategy’ in House of Lords. The EU drugs strategy, oral and written evidence. Home Affairs Subcommittee of the European Select Committee. http://www.parliament.co.uk. Mejia, D. (2015). Plan Colombia: An analysis of effectiveness and costs. https://www.brookings.edu. Miraglia, P. (2015). Drugs and drug trafficking in Brazil: Trends and policies. Brookings: http://www.brookings.edu. Organisation of American States. (2013a). Scenarios for the drug problem in the Americas 2013–2025. https://www.oas.org. Organisation of American States. (2013b). The drug problem in the Americas. https://www.oas.org. Philippines Daily Inquirer. (2016, October 16). Story in numbers war on drugs. https://www.newsinfo.inquirer.net. Potter, G. R., & Chatwin, C. (2018). Not particularly special: Critiquing “NPS” as a category of drugs. Drugs: Education, Prevention and Policy. https://doi.org/10.1080/09687637.2017.1411885. TNI. (2016b). The UNGASS outcome document: Diplomacy or denialism? https://www.tni.org. United Nations. (1961). Single convention on narcotic drugs. http://www.druglibrary.org/schaffer/legal. United Nations Development Programme. (2015). Perspectives on the development dimensions of drug control policy. www.undp.org. UNODC. (2008). World drug report 2008. http://www.unodc.org/documents. UNODC. (2010). World drug report 2010. http://www.unodc.org/documents. UNODC. (2016a). Outcome document of the 2016 United Nations General Assembly Special Session on the world drug problem. Our joint commitment to effectively addressing and countering the world drug problem. New York: UNODC. http://www.unodc.org/documents. UNODC. (2016b). World drug report 2016. http://www.unodc.org/documents. West Africa Commission on Drugs. (2014). Not just in transit. Drugs, the state and society in West Africa. http://www.wacommissiondrugs.org. Zhang, S., & Chin, K.-L. (2015). A people’s war: China’s struggle to contain its illicit drug problem. Brookings: https://www.brookings.edu.